Commission member Tom John stressed that the commission did not certify the equipment to help MicroVote. The action was taken, he said, "for the sake of hundreds of thousands of voters who otherwise would have voted on pieces of paper" and would have had to wait weeks while the ballots were counted to learn the results. that's all well and good, but there's only one good reason to certify the machines: if the machines work, they should be certified. if they don't, they shouldn't. maybe john thought that was implied in his statement, but it wasn't. This one should have been caught. Election officials "proofread" and signed off on the ballot before it was sent out, and so did Pike Township Schools Superintendent Nathaniel Jones. With the foul-up, there is now talk of post-election legal challenges. All because people couldn't count to three. People including the superintendent of schools. Is it any wonder Johnny can't count? no wonder the job market for editing is so tough: everybody seems to think they can do it themselves. then we end up with ballots with the wrong candidates listed or other blatant errors like this. but enough about my job-hunting troubles; we're talking about the elections here. 5. You've said you're not running again for clerk. Are you getting out of politics to find saner work? And how much does the clerk's job pay? Yes. At least for now. I love doing this job, despite everything and as crazy as that sounds. I love doing public service. At some point, if the offer was right, I might come back into politics. But for a while, I would like to get out in the real world and make some money. The clerk gets $78,000. yesterday, marla stevens wrote a post on bilerico called "Kiser revisited or Here's a real "Word" for the wise..."
Editor's Note: This post has been removed under threat of litigation by the Kiser campaign. We're a small independent blog that doesn't even sell ad space. We have no means to fight the litigation. While we're big believers in the right to free speech and the author has credible sources, until those sources will go on the record officially, this post has been removed. note that one of her older posts is still there, so either that one wasn't as objectionable to kiser, or kiser didn't realize/remember it was still there. i tried finding a copy of this post in the google cache, but it's not there. i guess it was deleted early enough to be kept out of the index. update: steph has a rundown of the whole story here, along with a copy of the deleted bilerico post, which she pulled from the RSS feed. Just weeks after her book was released with a first printing of 100,000 and a wave of favorable attention, publisher Little, Brown and Company announced Thursday that it would be pulled from store shelves and that retailers had been asked to return unsold copies, CBS News correspondent Bianca Solorzano reports. Viswanathan, 19, has apologized repeatedly to author Megan McCafferty, saying she had read McCafferty's books voraciously in high school and unintentionally mimicked them. Similarities to McCafferty's books, which include "Sloppy Firsts" and "Second Helpings," were first spotted by readers. They alerted McCafferty, who then notified her publisher. Crown alleges that at least 40 passages "contain identical language and/or common scene or dialogue structure." Little, Brown has said the book will be revised as quickly as possible, but in its statement made no reference to a new edition. In its statement, Little, Brown did not say how many passages would be changed. Viswanathan's misdeeds could be blamed on inexperience, or her involvement with a book packager, 17th Street Productions, which helped her shape the story. i had wondered about the involvement of 17th street productions, which is some kind of youth marketing firm that was brought in to mold the book into something they thought would be more marketable. viswanathan could have pulled a domenech and blamed 17th street for the plagiarized text making it into her novel, but she did the mature thing and admitted culpability. of course, she said it was all subconscious, which sounds rather like a cop-out, but it is possible that she had simply read the books so many times that she didn't realize all those words were coming from her memory rather than her muse. Her parents were not immune to the competitive pressure, however. Because they had never applied to an American educational institution, they hired Katherine Cohen, founder of IvyWise, a private counseling service, and author of "Rock Hard Apps: How to Write the Killer College Application." At the time IvyWise charged $10,000 to $20,000 for two years of college- preparation services, spread over a student's junior and senior years. But they did have limits. "I don't think she did our platinum package, which is now over $30,000," Cohen said of Viswanathan. An Indiana mother recently accompanied her daughter and her daughter's boyfriend to one of Indiana's Planned Parenthood clinics, but they unwittingly walked into a "crisis pregnancy center" run by an anti-abortion group -- one that shared a parking lot with the real Planned Parenthood clinic, and was designed expressly to lure Planned Parenthood patients and deceive them. The group took down the girl's confidential personal information and told her to come back for her appointment, which they said would be in their "other office" (the real Planned Parenthood office nearby). When she arrived for her appointment, not only did the Planned Parenthood staff have no record of her, but the police were there -- the "crisis pregnancy center" had called them, claiming that a minor was being forced to have an abortion against her will. The "crisis pregnancy center" staff then proceeded to wage a campaign of intimidation and harassment over the following days, showing up at the girl's home and calling her father's workplace. Our clinic director reports that she was "scared to death to leave her house." They even went to her school and urged classmates to pressure her not to have an abortion. the story isn't exactly new, and it's hardly exclusive to indiana. you've probably seen the ads for these places on billboards and benches near highways and in poorer communities: pregnant? need help? many of these are actually fake clinics established by religious fundamentalists to browbeat or otherwise scare pregnant women into going to term. rep. carolyn maloney of new york has sponsored a bill (HR 5052) that would bar these non-clinics from advertising themselves as providing abortion services. the ACLU initially came out in favor, raising the eyebrows of those who see it as a free speech issue. a few days later, the ACLU apparently pulled down its recommendation in light of this dispute. "I am troubled by the assumption in the legislation that abortion services, as a matter of linguistics and a matter of law, cannot include discussing with a woman why she shouldn't have an abortion," said Ms. Kaminer, a Boston attorney and author who described herself as "very strongly pro-choice." Not later than 180 days after the date of enactment of this Act, the Federal Trade Commission shall promulgate rules to prohibit any person to advertise with the intent to deceptively create the impression that such person is a provider of abortion services if such person does not provide abortion services. the bill then defines "abortion services" as "providing surgical and non-surgical procedures to terminate a pregnancy, or providing referrals for such procedures." in other words, according to the bill, abortion services includes abortion (makes sense, right? ), and places that advertise themselves as providing abortion services must actually provide them. it's pretty straightforward. nowhere does it say that the clinic cannot "discuss with a woman why she shouldn't have an abortion". however, if they discuss it with her and she wants one anyway, they need to perform the service or give her a referral. i've blogged about some other indiana congressional districts, but haven't said too much about my own, the 7th. in part this is because the incumbent julia carson has a lock on the democratic nomination, and probably the whole election; her challenger kris kiser's campaign is a joke, despite what you might think from his billboard on keystone. and whoever gets the republican nomination will have a hell of a time trying to unseat carson: many have tried and failed. if it is true that franklin tells his office manager not to rent to people on disability, that would be a flagrant violation of the fair housing act and the americans with disabilities act and probably a whole bunch of other federal and state laws. incidentally, is it significant that the first hit when googling "ron franklin indianapolis" is not his campaign website but this 2000 entry in the indy star factfiles? Former Indianapolis City-County Councilman Ron Franklin was found not guilty of a felony drug charge. It was the second time he was acquitted on drug charges after claiming the drugs belonged to someone else. yesterday's raids at ifco systems netted more than 1,000 undocumented workers across the country. that's a lot of people for just one company. so how many managers and executives were arrested? Seven current and former managers of IFCO Systems, which has offices in several states, were arrested and charged in connection with the employment of illegal immigrants, said U.S. Attorney Glenn Suddaby in Albany, New York. Suddaby said two lower level employees were also charged in the case. seven managers and two "lower level employees". that's it? these nine people are the only ones who knew about undocumented workers and looked the other way? it doesn't seem quite fair or realistic that more than a thousand immigrant grunts are taken away but only seven members of management get arrested. that doesn't sound like much of a crackdown on the employer to me; it sounds like a dog and pony show. A customs official said federal authorities checked a "sample" of 5,800 IFCO employee records last year and found that 53 percent had faulty Social Security numbers. "They were using Social Security numbers of people that were dead, of children or just different individuals that did not work at IFCO," Immigration and Customs agency chief Julie Myers told CNN. "The Social Security Administration had written IFCO over 13 times and told them, 'Listen, You have a problem. You have over a thousand employees that have faulty Social Security numbers. And we consider that to be a big problem.' And IFCO did not do anything about it," Myers said. Myers said a yearlong investigation revealed that IFCO managers had induced illegal immigrants to work there, telling some of them to doctor W-2 tax forms or saying that they did not need to fill out any documentation at all. He said his pay was based on contract — a quarter for every pallet he built. He said he typically put together about 400 pallets a day on nine to 10 hours of work. this is san antonio, so maybe indy workers were making more (or less), but let's do some math. not a good wage, but better than working at mcdonald's. so much for the idea that these workers were being paid less than minimum wage. after all, everyone knows that if you want to pay sub-minimum wage, you'd do better just offshoring the whole factory. Yesterday, ICE agents arrested seven current and former manages of IFCO pursuant to criminal complaints issued in the Northern District of New York. All these individuals are charged with conspiring to transport, harbor, and encourage and induce illegal aliens to reside in the United States for commercial advantage and private financial gain, in violation of Title 8, USC Section 1324 (a). The conspiracy charge carries a penalty of up to 10 years in prison and a fine of up to $250,000 for each alien with respect to whom the violation takes place. Two other IFCO employees were arrested on criminal charges relating to fraudulent documents. In addition to the criminal arrests, ICE agents yesterday conducted "consent" searches or executed criminal search warrants at more than 40 IFCO plants and related locations in 26 states that resulted in the apprehension of approximately 1,187 illegal alien IFCO employees. Three of the criminal search warrants were executed at residences in Guilderland, NY, where IFCO was allegedly housing illegal alien employees. The consent searches and search warrants were conducted at locations in Alabama, Arizona, Arkansas, California, Colorado, Florida, Georgia, Illinois, Indiana, Louisiana, Massachusetts, Michigan, Minnesota, Mississippi, Missouri, New Jersey, North Carolina, Ohio, Oklahoma, Oregon, Pennsylvania, Tennessee, Texas, South Carolina, Virginia and Utah. 10 years per aliens × a whole bunch of aliens = you will probably die in jail. the arrestee ratio of manager-to-immigrant seems very low, but those token manager arrestees face a lot of hard time. According to a government affidavit filed in the Northern District of New York, the investigation began in February 2005 when ICE agents received information that IFCO workers in Guilderland, NY, were witnessed ripping up their W-2 tax forms and that an IFCO assistant general manager had explained that these workers were illegal aliens, had fake Social Security cards and did not intend to file tax returns. According to the affidavit, subsequent investigation indicated that IFCO officials transported illegal aliens to and from work; paid rent for the housing of illegal alien employees; and deducted money from the aliens' monthly paychecks to cover these expenses. Former IFCO employees also said it was common practice for IFCO to hire workers who lacked social security cards or produced bogus identification cards. The affidavit also alleges that IFCO officials knowingly hired an illegal alien who was an informant for ICE. In numerous recorded conversations, IFCO officials reimbursed this person for obtaining fraudulent identity documents for other illegal alien employees; used the person to recruit other illegal workers; and advised the person and other illegal alien employees on how to avoid law enforcement detection, the affidavit alleges. there's also a list of the seven managers and two "lower-level employees" along with brief job descriptions, which conveniently saves me from having to google them myself like i've been doing at masson's blog. 2nd update: indy star is reporting that "with one exception", the arrested immigrants are being released and given court dates. wish-tv is reporting that "a roundup of dozens of immigrants" has been arrested, handcuffed, and taken downtown on buses to immigration offices, right here in indianapolis. wish reports that, according to a customs spokesman, this raid was part of "an ongoing worksite enforcement investigation" with details forthcoming tomorrow. wish also names ifco systems as one of the employers that was raided. i can't find the story on the wish website or elsewhere online, suggesting this story is still breaking. by tomorrow, if not within a couple hours, there should be more info about the indy raids online. however, i did find an article about similar raids today other ifco facilities in evendale, ohio (outside cincinnati), houston, charlotte, and elsewhere. clearly this isn't an isolated incident but a nationwide crackdown on ifco systems (and possibly other employers). but still i must wonder about the timing. this happened right on the heels of massive, highly successful immigration protests. it's hard to ignore the feeling that this was a stunt to demonstrate that the government is serious about immigration. update: an AP story about the indy raids has hit the wire. not a lot of new information there. The conspiracy charge carries a penalty of up to 10 years in prison and a fine of up to $250,000, for each alien with respect to whom the violation takes place. In addition to the arrests, agents executed search warrants at the IFCO plants in Guilderland, New York; Cincinnati, Ohio; Westborough, Massachusetts; Richmond, Virginia; and Biglerville, Pennsylvania, and at three residences in Guilderland, New York. The IFCO satellite locations within the Target Distribution Centers in Amsterdam, New York and Wilton, New York were also targets of the ICE operation on Wednesday. we probably won't get much more information until tomorrow after ICE (immigration and customs enforcement, formerly known as INS) lays out its new plan for pursuing companies that hire undocumented workers. indiana primaries are coming up in a couple weeks, and things are going to be hectic. for starters, indiana recently passed a voter ID bill that was recently upheld on appeal. seems like a recipe for disenfranchisement to me, though republicans naturally disagree (though they only seem to offer anecdotal evidence) and say there was no partisanship in their support for the bill (even while accusing democrats of partisanship for opposing the bill). i guess we'll see what happens. but ID problems are just the beginning of indiana's election issues this year. ES&S delivered the first batch of ballots March 27, more than a week after the deadline to mail absentee ballots to voters. Sadler said proofreading by election officials found they were rife with mistakes. Subsequent batches have turned up new mistakes, causing election officials to question whether the company could correct the problems in time. Sadler said the name of one Lawrence candidate for state representative was left off the ballot. another vendor, microvote, is also in trouble, and ES&S is also facing problems in other states. "This is not a willful announcement of breaking the law," Marion County Clerk Doris Anne Sadler said. "It's a report that we can't physically comply because the vendor hasn't provided what they are supposed to provide." The Help America Vote Act requires all voters be able to cast a ballot privately and independently, so Marion County spent $3.8 million in 2003 to buy 615 touch-screen machines for people with disabilities. without the touch-screen machines, those disabled voters will require assistance to use the old-school optical optical scanning machines, in violation of the help america vote act. on top of all that, TDW reported yesterday about problems with absentee ballots: minor problems like republican candidates showing up on democratic ballots. oops! the news was flooded last night with reports of successful tests. but the big test of voting machines was this morning. surprise, surprise: they failed, and school board ballots in marion county will need to be counted by hand. Some of Marion County's votes in the May 2 primary election will have to be counted by hand, but election officials say it is not the fault of voting system vendor Election Systems and Software. Election workers finished testing the tabulation equipment Tuesday morning. It counted all sample ballots accurately, except those for the Washington and Decatur Township school board races. Election officials said the school board ballots in those townships are so complicated that the software is unable to handle them, 6News' Norman Cox reported. hold on a second: if the ballots are too complicated for the software, that suggests there's a problem with the software. indiana needs software that is capable of handling indiana ballots. ES&S clearly did not provide software with this capability. it seems glaringly obvious to me that ES&S is at least partly at fault. now, maybe indiana's ballots are more complicated than they should be. and it's perfectly possible that county clerk doris sadler is also partly to blame. but let's not give ES&S a pass for incompetence. Apparently, 47 counties are currently using equipment that hasn't been certified by the State. But, you say, how did this happen? MicroVote, the vendor providing the equipment and software, says they told all these counties that they were updating the machines with uncertified software, but there are some doubts about that. Regardless of who's at fault, here's what has to happen: The State must certify these machines before May 2, or all 47 counties are going to be left having to hand count their ballots. The kicker? The only penalty the State can impose on MicroVote (beyond turning over information for possible criminal prosecution) is to prevent them from doing business in Indiana for five years. i don't know why the counties would agree to let microvote install uncertified software; that sounds like a lie. occam's razor would suggest that microvote installed uncertified software without the counties' knowledge. my car seems to have escaped any damage from last night's storm, but as you can see here, my sister's car was riddled with small dents, especially on the hood. the indy star summarizes some of the damage, with overturned semis, flooding, and plenty hail damage. the photo slideshow is good, too. the story mentions the stormy excited experienced at victory field during the indianapolis indians' opening game, which was eventually suspended due to rain and threat of tornado. jason was there and shares his experience. so virago & i are sitting at olive garden when i hear my cellphone beeping in my pocket. in the noisy restaurant, i have missed hearing it ring and am being notified of a new voicemail message. i check the number and it's someone from home, which is strange because i had just left there two hours earlier. the voicemail is a cryptic message asking if we are "safe" and mentioning something about property and auto damage, both at my house and at my parents' house a few blocks away. we had driven through some rain and seen lightning on the drive to castleton, but nothing too severe, so i am puzzled. still, it sounds like everyone is okay so we continue with our meal. not much later, i hear my phone ringing again. it's my mother, who informs me that the neighborhood has been hit by hail the size of eggs, which has broken a window and dented their cars. chicken eggs. hail the size of chicken eggs. there had been no such hail in castleton. we finish our meal, shop for a while, and head home. at two different points on meridian st there are signs reading "high water", and we are forced to decide whether to caulk up the wagon and ford the river or try to go some other way. we risk it, though some other drivers are not so brave. at some point the radio gets tuned to WBDG, the radio station run out of ben davis high school, and the dj is freaking out about all the tornadoes and hail he thinks will hit him any second. over and over he insists that this is a "severe situation", and eventually flees the studio to find shelter for himself. finally we park and get back to virago's apartment. her cat is panicked, hiding in the bathroom. tellingly, the cat that normally can't shut up for 5 minutes is unsettlingly quiet. she knows something freaky is going down. this past monday saw massive rallies nationwide to protest recent republican attempts to crack down on "the problem" of illegal immigration. in cities throughout the country, immigrants (both legal and illegal) and their friends and supporters filled the streets. indianapolis was no exception: the indy star estimates 20,000 protestors "in what may have been the largest rally in the city's history." (gary welsh at advance indiana estimates 50,000.) i didn't hear about it in advance so i wasn't able to get down there, though we could've seen the whole thing from virago's apartment. republicans are in crisis over immigration. in december, the house passed a bill that would've made immigrating to the country without authorization—or helping others to do so—into a felony. with an estimated 11 million illegal immigrants in the country, that's eight digits of felons, including 1.6 million felonious children. it also would've called for some 700 miles of fences along the mexican border, because let's face it, the only immigrants anyone is worried about are latin immigrants. eventually the senate came up with a compromise bill that would've allowed some immigrants to move on to citizenship but would've forced many to leave the US. (unlike gary, i definitely think this would be an undue hardship for many who might not have a safe, stable place to go in their home country.) but this bill also would've been impossible to enforce (as stoller points out, how can you tell how long an undocumented immigrant has been in the country?) and never came close to passing, either, so it's all a wash for now. sensenbrenner and other republicans wrote the bill, complete with language making undocumented immigration a felony. sensenbrenner later offered an amendment reducing the penalty from felony to misdemeanor, not because he had a moment of clarity or compassion for immigrants but because misdemeanors are easier to process. democrats voted against the amendment, presumably because they don't want to criminalize undocumented immigration. despite this failure to pass the amendment, republicans proceeded to pass the bill, with the felony language intact. only 36 democrats voted for the bill, and i don't imagine many more would've voted for it if the penalty had been reduced to misdemeanor, so how exactly is it democrats' fault that republicans passed this bill? now, in the aftermath of the rallies, reports are coming in of protestors losing their jobs for attending the protests. an article in this morning's indy star mentions reports of nearly 20 indianapolis residents losing their jobs, and even confirms two of them. an RTV6 and WTHR mention 8 people being fired by 5 different employers. and that's just in indy: similar incidents happened in seattle, detroit, houston (and elsewhere in texas), fort myers, FL, and probably more. in detroit, the employer has since agreed to give the workers back their jobs, "[b]ut only if they have proof they are in the United States legally." that's nice, i guess, though most of the fired employees probably won't get their jobs back. and in texas, benchmark manufacturing, another company that fired employers for protesting allegedly knew its employees were undocumented and looked the other way. i suspect this is common, though. this nation was built by immigrants and founded by people whose families had only been here for a few generations. there was no such thing as illegal immigration until the 1930s; before that, people just moved here and that was it. every once in a while, a new group starts moving here in large numbers. some of the people whose families have been here a bit longer get restless, weirded out by the foreign customs and languages of the newcomers. it happened with the irish, poles, and italians (who were once all considered racial underclasses but have since been assimilated into being simply "white") and now it's happening with latin immigrants. a free, multicultural society like ours should have no problem adapting to latin immigrants just like it's adapted in the past. longtime readers will recall the story of how local record store berry's music was busted in 2004 for selling mix tapes. mix tapes are recordings of dj mixes, these days generally recorded on cd, and can be a major promotional tool, especially in the world of hip-hop. record labels secretly love mix tapes because they equate to free promotion. but the major labels can't openly endorse mix tapes because that would expose their hypocrisy regarding intellectual property. the going rate for a sample clearance is in the four-to-six-digit range, which means that releasing a mix tape according to the "rules" could potentially cost millions. obviously, djs aren't paying these fees, which makes mix tapes "illegal" in the eyes of the RIAA. POLICE officers in Norfolk, Va., raided a record store called Dappa Don Clothing Company last month, confiscating several thousand dollars' worth of mixtapes and charging the store's owner with illegally "selling certain recorded devices." The raid was the latest in a nationwide crackdown on retailers who sell mixtapes — collections of hip-hop songs that D.J. 's remix to create new tracks — and it comes less than a year after New York police officers seized hundreds of mixtapes and arrested five employees at an East Village record store, Mondo Kim's. After the Mondo Kim's raid, Brad Buckles, a Recording Industry Association of America executive, declared, "Retailers who are making money on the backs of musicians and record companies by selling pirated CD's should know that this is absolutely no way to conduct a business." That sounds reasonable enough. Illegal products should not be sold. But it's disingenuous for the recording industry to compare hip-hop mixtapes to a bootleg recording of, say, a Dave Matthews Band concert. After all, mixes aren't bootlegs at all— they're advertisements. everyone is buzzing about scooter libby's latest testimony in the CIA leak case: apparently cheney told libby that the president had personally authorized him (libby) to leak classified information to the press in an effort to discredit joe wilson. if this is true, if libby didn't perjur himself with this testimony, that makes the president the leaker-in-chief. a couple years ago, when richard novak first outed plame to the public, bush got all huffy and insisted that he wanted to know as badly as anybody who the leakers were in his administration. he insisted he would get to the bottom of it. now it turns out that he already knew who the leaker was, because he was the leaker himself. A senior administration official, speaking on background because White House policy prohibits comment on an active investigation, said Bush sees a distinction between leaks and what he is alleged to have done. The official said Bush authorized the release of the classified information to assure the public of his rationale for war as it was coming under increasing scrutiny. in other words, it's not leaking when the president does it. part of this is that the administration is arguing that the president's decision to disclose the information constitutes a de facto declassification. and of course the president can declassify information, though he's supposed to follow certain procedures that seem to have not been followed here. Setting all that aside, what is most revealing is the attitude suggested by the White House official rather than just the net outcome. Beyond the legal particulars, the president's attitude seems to be that the law just doesn't apply to him -- and that's not surprising since we see so many other instances of that perspective in practice. Peal back all the individual arguments from Al Gonzales and the president and whomever else they put forward, the underlying idea is not so much that the president is above the law as that he is the law. He embodies it, you might say, even embodies the state itself. And thus what he does can't be illegal. What he does is simply the state cogitating and defending itself. This is a vision that simply incompatible with any idea of separation of powers because in this view the president's prerogative always trumps the other two branches. And that makes it a grave danger to our constitutional system itself. 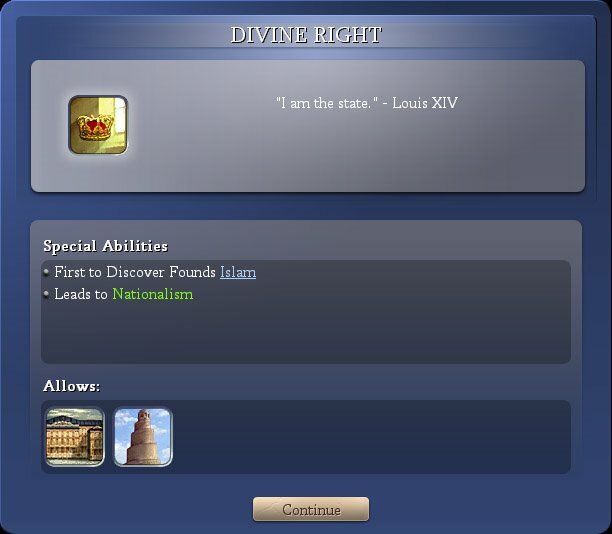 i've been wanting to go into civilization iv and pull this screenshot for months. i particularly like the fact that this technology leads to nationalism. the good news is that now we can build versailles over in occupied baghdad, which will substantially reduce the maintenance cost of nearby cities. the bad news is that we were not the first to discover so we didn't get to found islam. Also, the official said, the president has not been accused of authorizing the release of the name of Valerie Plame, the undercover CIA operative whose unmasking in a July 2003 newspaper column prompted the federal investigation. "There is a clear difference between the two," the official said. "I understand that in politics these two can be conflated. And we're going to have to try to deal with that. But there is an active investigation and that limits our ability to do so." Still, Bush's action stands in stark contrast to his condemnations of the kind of disclosure that the court filing said he authorized. "Let me just say something about leaks in Washington," Bush told reporters in September 2003. "There are too many leaks of classified information in Washington. There's leaks at the executive branch, there's leaks in the legislative branch, there's just too many leaks. I want -- and if there's a leak out of the administration, I want to know who it is. And if a person has violated law, the person will be taken care of." chevrolet and nbc's the apprentice have a contest where you can create your own chevy tahoe tv ad using stock clips and a simple point-and-click interface. the process is very simple. it wasn't long before subversive ads starting turning up, ads with messages that chevrolet and nbc might not like. there were naturally ads that mocked the tahoe over environmental issues. but more than that, subversive ads on a variety of other subjects appeared. the site has been quietly deleting some such ads when it finds them, so those links could go dead, but people with video capture software have been archiving some ads and submitting them to sites like youtube. i came in a bit late, but i had to join the fun. here is mine. maybe it's a little obvious, but i made it quickly late at night. maybe i'll be inspired to make more.